Great work here! Would love to have lighting options for icon creation. Specifically, just using the “use no lights” option. Or is there some way to do this by editing the camera in use. Looking forward to that 6.5 update as I too am getting the “Open, Edit, Edit Pop-Up, Delete” bug when I right-click on the icons instead of the intended options. Thank you for this great tool. It’s awesome. 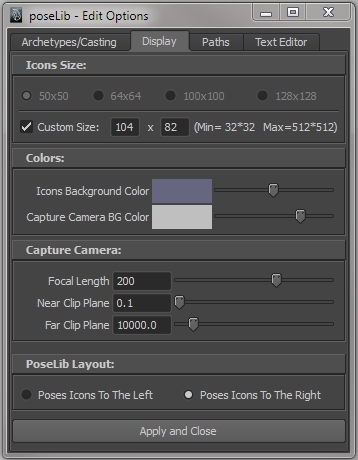 I was just wondering, I cannot seem to arrange the pose Icons. When I create one, it just places it in the middle of the pose library window and they just add up one after the other. I cannot rearrange them. Have you had this issue? Normally it should be possible to rearrange the icons by middle-mouse click-and-dragging them. Doesn’t that work anymore? Hi Seth! First off, thanks for this awesome tool! 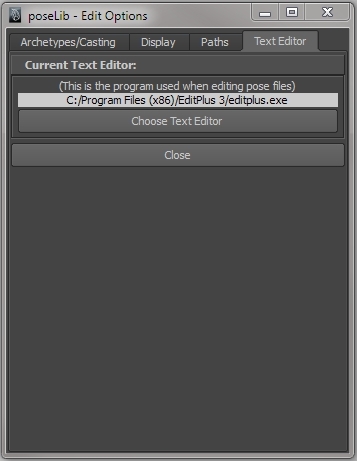 I am currently running into the problem that the ‘open pose in text editor’ option only works if there are no spaces in the pose name, or the file path. Since there are quite a few dependencies to said file paths on my computer, I can’t change them at the moment, so would you know how I need to change the $poseFilePath variable to convert spaces to make windows understand them? I’m using windows 7 x64. Hi Seth! Thanks for the quick reply! 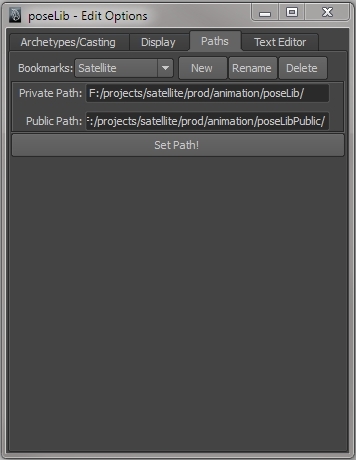 I even would have gone so far as to hardcode the actual path into the mel script, since I use the same poselib directory for all my projects on all my maya versions. Anyway, many thanks for your help! Really appreciate it! Yes, I think this is due to the fact that some TDs choose to lock those variables (ie: in a a referenced scene) within a custom pipeline. More often than not you just need to ask them to exclude defaultHardwareRenderGlobals from the lock and things should work fine. I had problem to use your PoseLib. and PoseLib did not working. I reinstalled script, but same result. Mmh I’m not sure. Is that the only error that appears in the script editor? Anything before or after? Is that a hard thing to do, or is it more or less copying the part about what happens when pressing the ‘alt’ key? Thanks, and sorry if that sounds kinda stupid! Nice one! Thanks for your input, Chris. In theory that could be possible but the result would be very unpredictable. Usually a pose represents a goal you want to reach (or blend towards), not an iterative value. Anyway, I’ll keep that in mind when I get the chance to go back to poseLib (which isn’t anytime soon unfortunately). Hi! Sorry, I didnt see you already replied I found someone who helped me implement this, basically its good if you want to blend basic shapes, like a wide mouth shape and an open one. I used Poselib in the past and it is an awesome and indispensable tool! Thanks for updating it so it runs on current maya versions! Thanks for the update. I’m trying to download 6.5.0 onto a Linux (CentOS) machine but the rar file (34.5kB) tells me the file inside is 0kB. Would it be possible to upload it again or make it available in a different compression type please? Maybe there’s an issue with the app you use to RAR it up that is not compatible with Linux. Your previous version opened up just fine in Linux. I had to edit poseLibModule.py on line 272 the mel command attributeQuery. 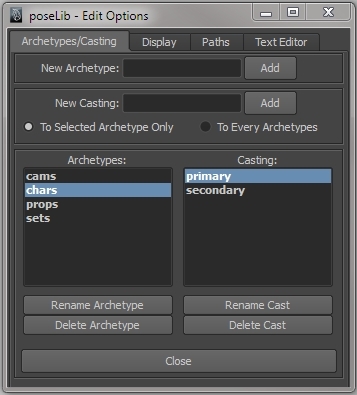 One of my objects had the attribute name switch and I think that the mel command would not accept a command as an item, So adding quotes ensures that the attribute name is taken as a string. Hi Francois, I just replaced the file with a zip archive which should hopefully be more standard than the rar one. Excellent Seith. Thank you very much! It works like a charm. Then let me know the result in the outliner please. It won’t fix the issue but hopefully it should help me understand what’s going on. Can you tell me if poseLib and Maya’s human IK are compatible – i.e. 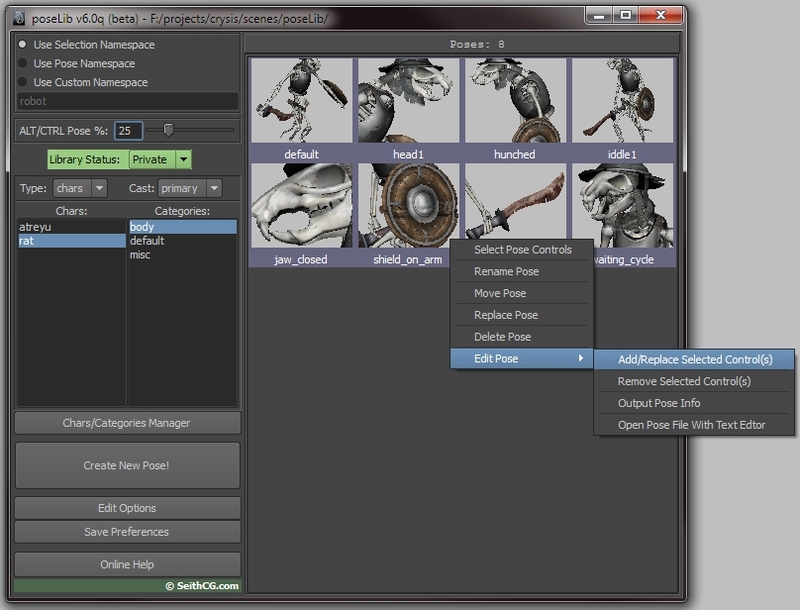 both plugins can run simultaneously and poses/animation can be generated using human Ik and then saved to poseLib? Hi Glyn, I’m really not sure (I never used human IK). I am trying to add pose, but it showing error i.e. // Error: file: C:/Users/AATS-11/Documents/maya/2013-x64/scripts/poseLib.mel line 1786: setAttr: Attribute ‘defaultHardwareRenderGlobals.startFrame’ is from a locked node, so it cannot be unlocked. And also I cannot change the path through the poselib plug in. I believe that error was reported earlier in the comments; it is usually linked to TDs locking the hardwareRenderGlobal’s attributes for animators in a pipeline. In that case you just need to ask them to unlock them and everything should work fine. So I helped an artist install your script on OSX today and encountered the same problem. The issue is that on line 95 a command is using the line continuation character “\” for an extra long string in the python call. Line continuation is dependent on the invisible line ending character which is different for Windows and Unix. Since poseLib.mel is provided with Window line ending characters it won’t work unless you switch the file to using Unix line endings in your favorite text editor. @Francois, I was getting the same error on a mac, a friend said it was because its using Windows line endings in that part of the code, when we changed it to Unix line endings it worked. Thanks. I actually have a new version of poseLib which takes care of all those problems. I’ll try to post it as soon as possible! when I try to create new pose It will appear “# Error: TypeError: object of type ‘NoneType’ has no len()” .How to fix it? I’ve just uploaded a new version of poseLib which should fix all the problems mentioned recently. But when I move the poselibModule.py file to my default maya scripts folder, it stops whining and works like it’s supposed to. It would seem this is caused by Maya not actually recognizing your Dropbox path as a proper Python module path (which is in fact different from the default MEL scripts path). Beyond that I’m afraid I can’t be of much help as this would be related to your specific Maya installation. Hi Francois, ( Hi Seith, super tool will donate! ) strange so few did. In our studio we keep a folder for scripts and shelves to share across our collegues. You will need to use an edited maya env. After running the script a local cfg file gets written. have not found a way to set that to the shared location. Creating poses, no problem. Applying poses, no problem. Working with my rig after applying the pose…problem. Rig controls don’t appear to work anymore. I’m working off a referenced character file, and not on an actual animation as of yet, but it seems this could be an issue maybe not showing up in previous versions of Maya? Hi Patrick. Yes, I haven’t used a recent version of Maya in several years so I’m sure some things must be broken here and there. I plan to eventually move on to Maya 2017 (not sure when) and as I do I will definitely fix poseLib to work with that. hi Seith. this is a wonderful tool to use. upon testing, specifically when apply a pose to another character, the joints’ location change too. this is not ideal when transfer a pose from a big character to a smaller one as the small character will blown up to the size of the big one. is it possible to only apply rotation values of joint bones to target skeletons without translating them? perhaps a toggle check box? so that after initialize a skeleton (freeze T pose) it could be easily apply poses to all other skeletons of any size. I could be wrong with only a few min of mess around. update: after more messing around, use “lock selected” would perfectly solve the transfer pose issue states above. I’m a CGer come from China,and I can’t download the latest version of poseLib with Chinese net.But I really need it. could you plz send it to my E-mail? And thank you again for help. and I want to tell you your wordpess can’t support Chinese. when I type Chinese here ,it will become ?? ?